When Alan Wardle’s niece searched online for family history she uncovered his father’s long-lost First World War presentation pocket watch coming up at auction. A presentation pocket watch awarded to Arthur Wardle, 2nd Lieutenant in the 2nd/6th Battalion Durham Light Infantry, which has now been acquired at auction by his son Alan Wardle for £1850. After a successful online bid at C&T Auctioneers of Kent, Wardle is now the proud owner of the watch belonging to 2nd Lieutenant Arthur Wardle, 2nd/6th Battalion Durham Light Infantry. The auction was the first he even knew of its existence. Alan Wardle, a first-time bidder, secured it on thesaleroom.com for £1850 (plus 20% buyer’s premium) in the November 6 sale held in Tunbridge Wells. The estimate was £300-500. Arthur Wardle, a miner from Bishop Auckland, was heavily involved in the last two months of the First World War. Two actions, on October 5, 1918, and another just a week before the Armistice, earned him a Military Cross and Bar (two MC awards). 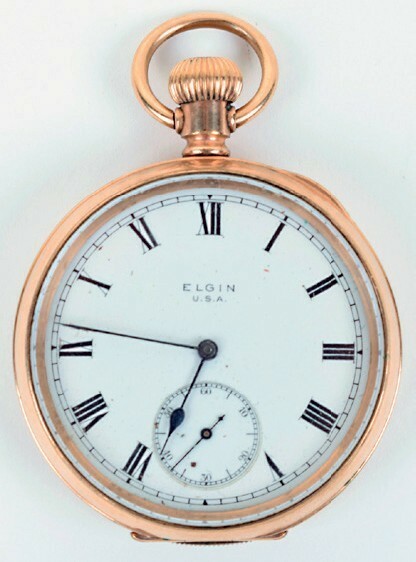 The typical Elgin National Watch Company pocket watch, with a gold-filled case, is inscribed inside Presented to Lieut A Wardle MC by the inhabitants of Castletown. For gallantry in France. Dec 28 1918. Arthur Wardle shown in bandages after being wounded by a bullet to the nose. Wardle believes the watch was sold when the mine his father had worked at closed down during the Great Depression in the 1930s. Wardle is learning more about his father’s time on the Western Front. “I once asked him if he was ever wounded in the war and he said ‘yes, I got a bullet through the nose’. For more on Armistice centenary auctions, see ATG's militaria feature in this issue.